All transactions are safe and secure with a reliable history in online purchasing behind each of our associates. 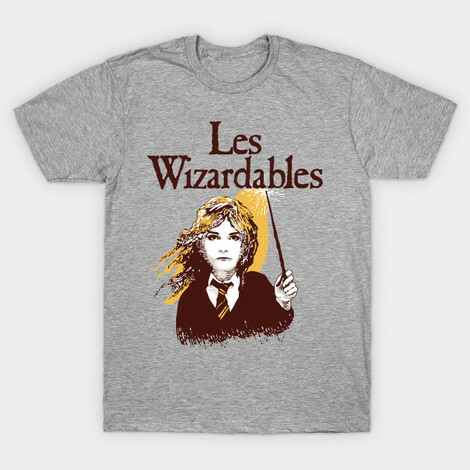 Buy the Les Wizardables t-shirt to own Harry Potter clothing and merchandise. This HP tee was inspired by the musical Les Misérables. This piece of clothing is perfect for young wizards planning to watch the Harry Potter and the Deathly Hallows movie or any of the HP movies. It's also perfect for fans of Hermione Granger. Whether you are an aspiring Hogwarts student who dreams of living in Hogsmeade, or just a wannabee wizard who casts a spell over everyone, this is the ideal design. Use it as part of a Harry Potter costume. In addition to the Les Wizardables tee above, browse the Harry Potter Clothing Gallery for more apparel like men's and women's clothes, kids shirts or hoodies.